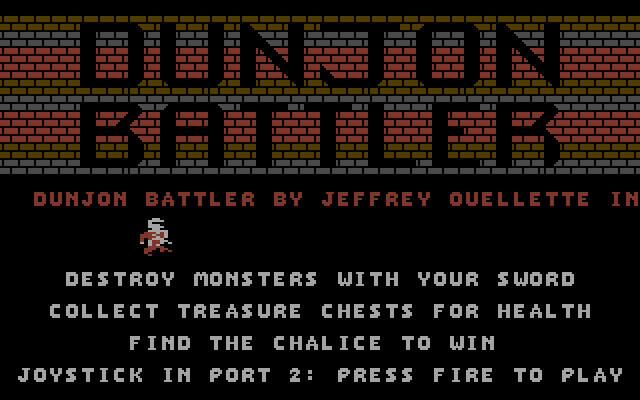 As the deliberate misspelling of the titular dungeon suggests, Dunjon Battler is an overly simplistic hack-and-slash arcade-style rpg that's light on the role play and heavy on the hacking. It may have the crude visual appearance of a game that's dropped out of a timewarp from 1985 and offer the seasoned adventurer practically zero cranial challenge, but despite this, Malcontent's first proper game release has proved to be a great deal of fun. The core gameplay is real base-level stuff; your nameless warrior must fight his (or her) way through the depths of a critter-filled dungeon to retrieve a magical chalice offering immortality. There are keys to collect (which are rather unsurprisingly used to open locked doors), treasure chests to loot (which also replenish the player's health) and countless re-spawning enemies to slay or avoid in each of the game's many single-screen battle arenas. The game map has been thoughtfully designed so as to not require the player to backtrack excessively and every side route leads to either bonus treasure or the necessary keys to proceed. However, the map design is just about the only sensible feature the game has - the rest of it is joyfully ridiculous. 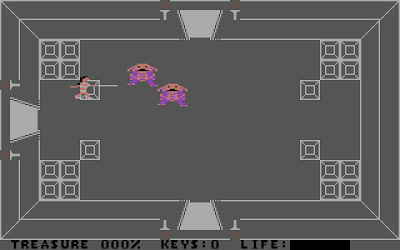 Starting with the graphics, the rooms are drawn in an overhead perspective that conflicts with the side-on view of the sprites, resulting in some confusing wall-clipping issues such as your player being able to walk though narrow passages that you might have initially thought were impassable. Also, the animated monsters appear to be having some sort of fit as they drunkenly lollop and bound about the screen in a considerably more jovial manner than perhaps is suited to the menacing beasts they are supposed to represent. However, on the plus side Malcontent has made a real effort to give the impression of a proper adventure, with distinctly different looking areas in the dungeon via the use of colour backgrounds, and the addition of double-sized sprites such as that used by the dragons and end of game boss gives the game some much needed variation. 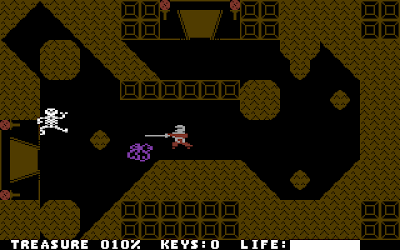 The player's controls are limited to four directions, which can make diagonally attacking enemies hard to dispose of. Well, OK, not hard as such, but certainly more difficult than the usual method of just holding out your blade in their general direction and allowing them to skewer themselves as they wander brainlessly and haphazardly towards you. This technique even works on the position-warping end of game boss - just hold out your sword in the area he'll teleport into next, and voila! Boss-kebab. My particular favourite special-attack (when the opportunity arises), involves prodding your sword through the dungeon walls, slaying your opponent without any fear of them retaliating – a combat move which never fails to raise a smile on the face of this reviewer. Dunjon Battler is goofy game design at its most laughable, but it's the game's silliness that has pulled me back again and again for another go. In fact, if it had been executed in a more serious manner then I very much doubt it would have retained the same level of charm. The presentation may be rough, but nonetheless it all feels very complete, with a proper end sequence and even a second quest to unlock. Refreshingly old-school and unpretentious, I sincerely hope that Malcontent's future games continue to offer the same fun-focused, playable and non-serious experience - albeit perhaps with just a little more visual finesse next time. 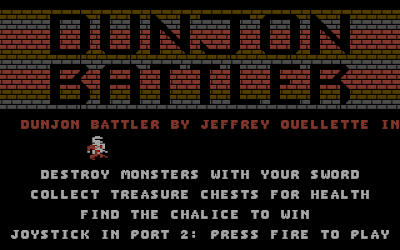 With a graphical facelift I'd award it a four, but as it stands Dunjon Battler deservedly receives a respectable three Atari joysticks. Download the game here (from Malcontent's website). Thanks for the review, sir, quite fair. 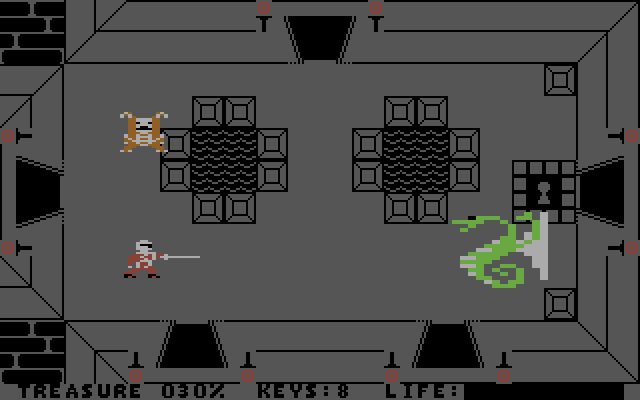 The misspelling is an homage to the Dunjon Quest series by Epyx by the way.